I’m about 60 pages from the end of Elizabeth Peter’s Naked Once More; and considering I'm off tomorrow, I have plans on sitting down tonight and finishing it. That means no PS4. So… I wobble a bit. Nonetheless, I do want to share the newly purchased books I'm following Naked Once More with. 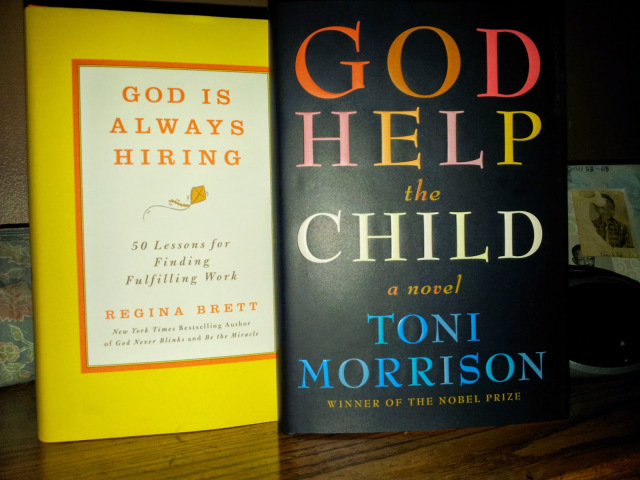 As seen, that'll be the latest by Toni Morrison, God Help the Child. Many of you know how I feel about Morrison’s writing post-Beloved. Therefore, I won't get into all that. The subject of brevity of style in place of coherency within scenes just won’t be discussed. But I feel like God Help the Child is going to be a good fit. At 178 pages, it'll be the perfect weekend read. And that’s exactly what I plan to do with it. Just to be certain of my decision, I stood in the front of the bookstore for a good ten minutes reading a couple of pages. I wanted to make sure Morrison's scenes bubbled up into my imagination effortlessly. I say that in contrast to a wall of prose I have to sift through to gather my bearings on what exactly is taking place within the story. Luckily, I got scenes. On the opposite side of Morrison’s display was a newly released book called God is Always Hiring. It’s written by Regina Brett, and is subtitled with the statement, “50 Lessons for Finding Fulfilling Work.” I ached over it, while squeezing my coupons in my pockets. Then I answered that little voice inside of me telling me that this was exactly–in this right moment and time in my life–what I needed read. It wasn't until hours later that I realized both titles contained "God" in it. Hmmm. I take that as some kind of sign.